CINCINNATI -- When a piece of the moon finds its way down to Earth, who owns it? One former Cincinnati resident said in a lawsuit she should be allowed to own moon dust that was gifted to her by astronaut Neil Armstrong, but NASA has a history of claiming it owns all lunar material. Now Laura Murray Cicco wants a court to declare her the rightful and legal owner of a vial of moon dust. Murray Cicco's family moved in 1969 or '70 to Cincinnati, where her father, Tom, a World War II B-17 pilot, was friends with Armstrong, according to a lawsuit she filed in U.S. district court in Kansas last week. Armstrong taught at the University of Cincinnati during the '70s, after he left the space program. 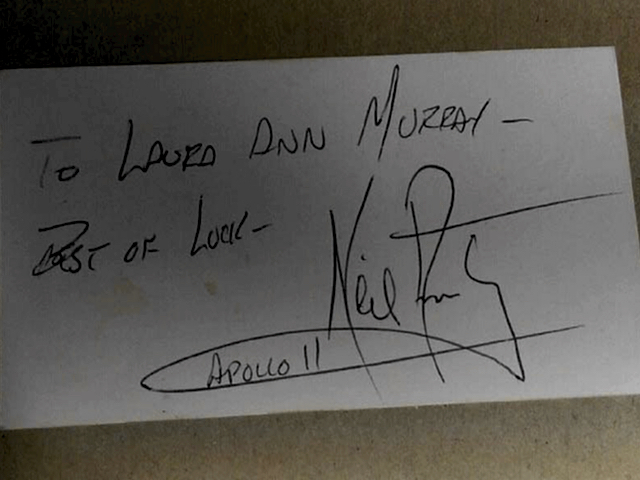 According to the lawsuit, when Murray Cicco was about 10, her mother gave her the glass vial filled with light gray moon dust and one of her father's business cards with a message from Armstrong written on the back: "To Laura Ann Murray - Best of Luck - Neil Armstrong Apollo 11." An expert has authenticated the signature as Armstrong's and lab testing determined the dust did come from the moon, according to the lawsuit. However, NASA has in the past held a position "that private persons cannot own lunar material," according to the lawsuit. A NASA spokesperson did not immediately return a call for comment. It's not specifically illegal to own material from the moon. But in past cases, NASA has equated possession of moon rocks to possession of stolen property because they never authorized it to be removed. In 2011, NASA investigators even organized a sting operation when the widow of a former engineer tried to sell a small piece of lunar material. She also said it was a gift from Armstrong. "NASA has been aggressive over its position," said Christopher McHugh, Murray Cicco's attorney. McHugh said Murray Cicco reached out to him because of another case he was involved with regarding a NASA lunar collection. They just want a judge to declare her the owner as a precaution. In this case, McHugh said it's clear there was nothing wrong with Murray Cicco possessing the moon dust, since it came from Armstrong. "He's not a thief," McHugh said. "He's an American hero." McHugh believes there are still many other people out there who possess moon dust or rocks. He said courts need to reach a final decision on the issue. "It's ripe for a resolution," he said.